Now that fall has finally arrived, most homeowners are taking a bit of time to enjoy just a few of the many things that these wonderful months of the year have to offer. Whether you are a big football fan, you enjoy all of the many upcoming holidays, or you just happen to be crazy about pumpkin spice everything, it is important to make sure that you don’t forget to take a little bit of time this fall to start preparing your home for the coming winter. There are a number of areas around your home that can benefit from a little bit of fall preparation, and your deck is no exception. The winter months can be fairly rough on your home’s deck, especially when the snow and ice start to come down, and taking this opportunity now while the weather is still fairly mild can be a great way to ensure that your deck is ready to go and still in great condition when the spring comes back around. In an effort to help you keep your home’s deck protected this coming winter, our team of professionals have put together a short list highlighting several of the most effective things you can do this fall to prepare it for what’s ahead. If you have deck furniture, planters, or other deck accessories, you know quite well just what a significant investment they can be, and the last thing you want to do when spring comes around again is to have to search for replacements. This fall, you are going to want to make sure that you pack away any of your deck furniture or accessories that could be damaged by the rain and snow that is sure to come down this winter. Deck furniture and planters that are left in place over the course of the fall and winter are also a magnet for falling leaves and other debris, and if they settle down beside them and remain in place for long periods of time, you can wind up with some particularly dirty spots when you go to move things around in spring that take a great deal of additional effort to clean away. While the fall leaves in the autumn can be quite beautiful, you might be surprised at just how much damage they can cause to your deck if they are left in place for any length of time. As these leaves and other organic matter start to decompose, they can become a hotbed of mold and mildew growth, which can pose a serious threat to the surface materials of your deck. In addition, this decomposing matter can result is very stubborn stains that can be quite difficult to get out once they’ve had to opportunity to set in over the course of the winter months. Taking a little bit of time now to ensure they are properly cleared away can save you a great deal of trouble when spring comes back around. With all of the moisture that your deck is going to be subjected to this winter from the rain, snow, and ice, it is important to take the time now in the fall to ensure your deck’s surface is properly protected. 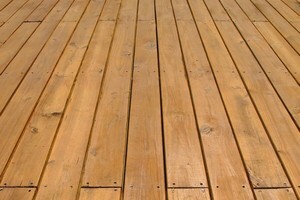 Moisture can be a very serious threat to your deck, especially if you have a wooden one. Any moisture that is allowed to sit on the surface for any length of time can start to see into the surface materials where it can lead to cracking, warping, and rotting. While cracking and warping can usually be repaired by replacing the damaged sections of your deck, rotting is a much harder enemy to combat, and you might be surprised at how quickly it can spread to other areas of your deck. Taking the time now to ensure that your home’s deck is properly protected against all of the moisture it is likely to be subjected to this coming winter might just be the difference between having a deck to enjoy, and having to shop around for a replacement. Contact your remodeling service team at Campbell’s Construction today! If you are looking for a professional New Jersey remodeling contractor, give us a call today at 732-623-9790 or fill out our online request form.